Having had two blogs at the beginning of my blogging ‘career’ there are some recipes which I know I have done, but when I search for them here, they don’t appear. I started blogging in September 2009 and only started this blog in April 2010. I don’t mind that I have to reproduce some of the recipes as at the beginning I did not even bother with photographs. When I finally did, I used the camera on my cell phone. Now I use a point and shoot Sony camera with a food setting and a timer. I don’t have money to spend on a decent food bloggers’ camera so for now, this will have to do. I had to make this cari recipe again as I will be sharing with you a recipe using the curry powder. My Curry book suggests you make your own curry powders from scratch, and I can readily agree with this. Cari is a Vietnamese curry powder which is influenced by Indian curries but uses star anise, an ingredient used in Vietnamese curries. 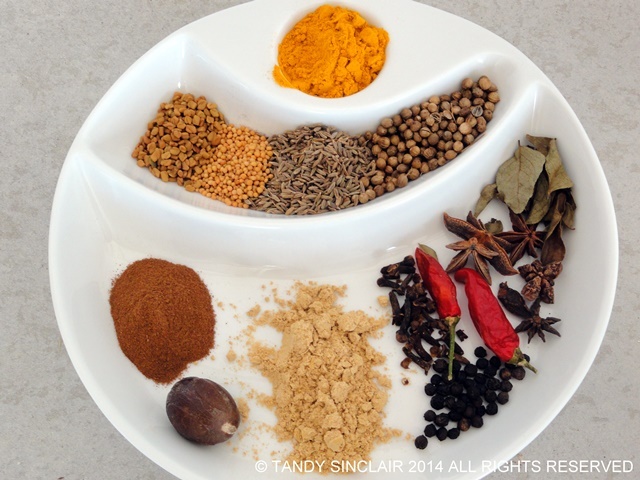 Do you make your own curry powders? What a great spice blend, I will have to try it out. Sounds beautiful – I sometimes make my own mixes but no two ever seem to turn out the same! Well that camera of yours takes some beautiful pictures! 🙂 I wish we had a really good camera too, I’m just using my phone camera for now and I know it’s not the best, but all I’ve got atm. A curry sounds like a good idea sometime this week, especially with the rain heading our way. Thank you for the compliment Melanie 🙂 I am thinking a curry is in order tonight given the miserable start to the day! Lovely curry powder Tandy. Your photo’s are lovely – no need for any other camera. Thank you for the compliment Mandy! I love discovering new curry recipes and spice mixes so I will try to have a go at this. Thank you BAM for the compliments 🙂 I would also love to reshoot my old recipes, but that is time I don’t have! Hi Tandy, I try and make most of my spice concoctions myself, sometimes I have to buy them already made but you just don’t know how old they are or exactly what they are. Looks like a great recipe.